*Dilly Dolls*: Somethin for the boys, finally! Somethin for the boys, finally! It's been a long time since I made anything for the boys. I decided, that as I started to venture into the world of mesh, that it was time to start creating for those male dolls out there again. Introducing Dolan, the male counterpart of Dola! Like Dola, Dolan is pinstriped and very meshy! I admit, it was weird making these on a male shape, cause the base sl male avatar mesh was not built as well as the female avatar (which is not the best either), so there are all kinds of weird spots to work around. Hopefully I will become more familiar with the male shape within Blender, so I can continue to make stuff for my dolly boys! Like Dola, Dolan is also available in 2 color pack variations, dark and light. 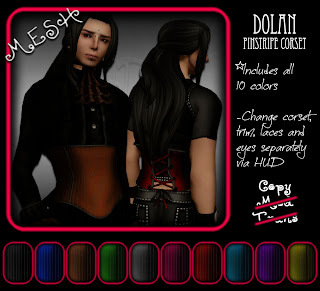 Both packs come with a texture HUD for you to customize the corset to your liking! And for my Dilly boys.....group gift time! These corsets come in all 5 of the standard sizes for males. Pop on into the shop for the demo! Of course its a corset!